Awards: 1914 – 15 Star, British War Medal, Victory Medal. Was a member of the Manchester Unity I.O.O.F. 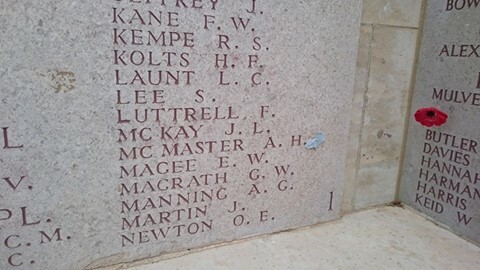 Memorial Wall – Lone Pine for Allan Hugh McMaster. Jaeger, Jerry, and the Juice. The Lady, the Lash, and the limb of the Law. Nick and Jerry Fined £30 Apiece. Those persons who used to find it rather convenient to visit an oyster saloon, when in search of a reviver, will probably find it rather difficult to do so now that the police have bagged one of the offending saloon keepers, who supply their customers with liquid refreshment, as well as meals on Sunday night, for most likely other saloon keepers will take warning, and drop the practice. The case referred to was one in which Nicholas Comino was proceeded against, at the Water Police Court, on Tuesday last, for selling liquor without a license, while a waiter in the saloon, named Jerry Rizos, was proceeded against for aiding and abetting in the sale of the liquor. Mr. Young (Instructed by K. C. Rexburgh ) appeared for both defendants, who Pleaded not guilty. Sub-Inspector Stephen said that at about 9.40 p.m.. on the 26th ultimo, in company with Sen.-Sergeant Stewart and Constable Thornley, he went to Comino’s oyster saloon, Alfred -street, City. In an upstairs room, he saw Constable Jaeger sitting at a table WITH SOME STEAK before him, also a bottle and glass. Rizos was called up to the table, and Stephen told him that Jaeger was a constable. ” He says you served him with this bottle of stout, and he paid you 2s for it, ” went on Stephen Rizos said, ” I no sell it ; he gave me tip and I gave it to him. ” Later on, when Comino was called up, and told about it, he said, ” We don’t sell liquor, we give it to our customers. At least a man may pay for it on Saturday night, and we get it in, and keep it for him. ” Stephen told him that that was not so in this case, and Comino said, ” He was here last night, ” meaning Jaeger. Cominos asked Rizos if he sold Jaeger the stout, and he replied, ” No, he gave me tip, 2s. and I gave it to him. ” A search was then made, but no liquor found, although both in a closet at the top of the stairs and in the room in which they were standing, there were about two dozen dead marines about the floor. In answer to Mr. Young, witness said he did not mention marked money at all. He did say the man has the money on him now. When Comino spoke to Rizos, he pulled out a handful of 2s pieces and half-crowns. He knew it was customary for customers to give money to the waiters to go and get liquor. The place was well conducted. Constable Albert Adam Jaeger said, on Sunday the 26th, he received certain instructions, and went to Comino’s oyster saloon upstairs, and said to Rizos, who came to the table, ” I’ll have some steak, can you pet us A BOTTLE OF PORTER ” Rizos went away and returned with the perk. Jaeger gave him 2s telling him it was for the porter, and he nodded his head, but did not hand over any change. Witness then corroborated Stephen as to the conversation that took place. He then went on to say that, after the conversation, Rizos gave him a ticket for 1s for the meal, but, on handing Comino 2s 6d at the counter in payment, the latter said he would not take it, as it might be marked. He had been to the shop on four previous occasions, and each time had had stout, but did not give a tip. In answer to Mr. Young, Jaeger said he never gave Rizos 1/ tip on the Saturday night, or at any time. He went into the shop with a woman, but did not know her name, nor what her character was. He did not pick her up in the street, and go with her. She sat at the table, and he ordered a meal for her. She left the room, and was not present when he had the conversation with Rizos about the stout. He did hot know the woman took a message out to the other constables. Thornley gave her her instructions. Constable Allan Hugh McMaster said on Sunday, the 26th ult., he received certain instructions, in consequence of which he went to Comino’s oyster saloon, and sat at a table close to Jaeger, who asked for a bottle of porter, which was brought, and for which he paid Jaeger. Constable Harold Percy Lowther gave corroborative evidence. Mr. Young submitted that there was no case against Comino, as it had not been shown he knew of the transaction between Rizos and Jaeger, and cited cases in support of his contention ; but the magistrate held that there was a case to answer against each defendant. Nicholas Comino, proprietor of the oyster saloon, said he did not in any way assist or take part in the transaction, and he did not authorise Rizos to sell liquor to customers. When called up by the constable, he denied that he kept liquor on the premises. Stephen then said, ” Your man sold a bottle to a constable here, and he has a marked 2/ in his pocket new. ” He received 1/ in payment for the steak, but did not get 2/ from Rizos. The money was given to him as a tip, and not in payment for the stout. In answer to Mr. Stephen, Rizos said he had not made a present to any of the other customers. He gave the constable the stout for the shilling he gave him the previous night. Some of the customers have bottles of stout on Saturday night with their names on, and drink it on Sunday night. This bottle of stout had no name on it. Mr. Love decided to convict, and both Nick and Jerry were fined £30, with- 6/ costs, in default three months’ Imprisonment with hard labor ; 24 hours was allowed to pay. The following volunteers are leaving Glen Innes on Sunday night to go into camp at Liverpool prior to leaving for the front :— Hector Wm. McMaster (brother of the late Constable Allan McMaster who lost his life at the Dardanelles), Cyril John Roche, Cecil Stanley Avis, Alfred Ernest Jones, and Alfred Jones, the two latter being father and son. Private Norman and Jack Floyd, who have been on the sick list for the past couple of weeks, are also returning to camp on Sunday night.